Furnish and install the Portals Plus Extra Wide Alumi-Flash at all points where up to four pipes .375" - 1" in diameter penetrate the roof. The Extra Wide Alumi-Flash shall include a.060" spun aluminum base unit with a height of 4" and a base diameter of 18". The 8" collared opening shall have two beaded sealing rings roll formed into the top edge. 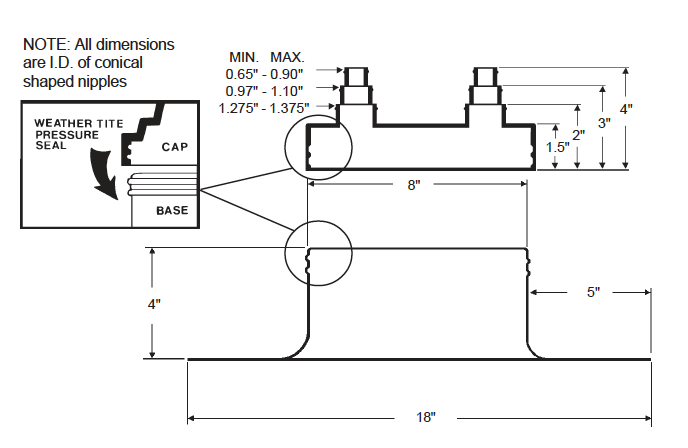 An EPDM (Ethylene Propylene Diene Monomer) compression molded cap model C-481 shall be utilized. All Caps shall include Portals Plus' stainless steel Snaplock Clamps. Attachment and installation of the Extra Wide Alumi-Flash shall be done in accordance with Portals Plus' instructions and the roofing membrane manufacturer's recommendations. *Sold by the carton only, quantity of 5. Priced per each below. Please call to place your order if expedited shipping is needed.